The Kitchissippi Museum: "Westboro" - but almost "Springbrae"! Sometimes an old newspaper article you stumble across is, by itself, blog-worthy. The one I'm sharing tonight is definitely in that category. For years I've researched the history of Westboro, and always knew that it was originally called "Skead's Mills" (after the Canadian Senator who owned much of the land in the area, and opened a saw mill by what is now Westboro Beach). But until recently, I never knew exactly how the name was changed. What brought it about, how did such a random name like "Westboro" get selected, and what other options were considered? So from the January 31st article above, the vote resulted in favour of Springbrae. Other considered names (including Westboro, and interesting names such as "Earlswood" and "Kingswood") lost out in the vote. "Brae" is an old Scottish term meaning "a slope, declivity or hillside", thus referring I guess to the slope down to the Ottawa River at the north end of the village. So by the time of the big meeting of Tuesday February 21st, enough convincing had been done that Springbrae was no longer the top choice. In fact, it came out as the last-place choice. 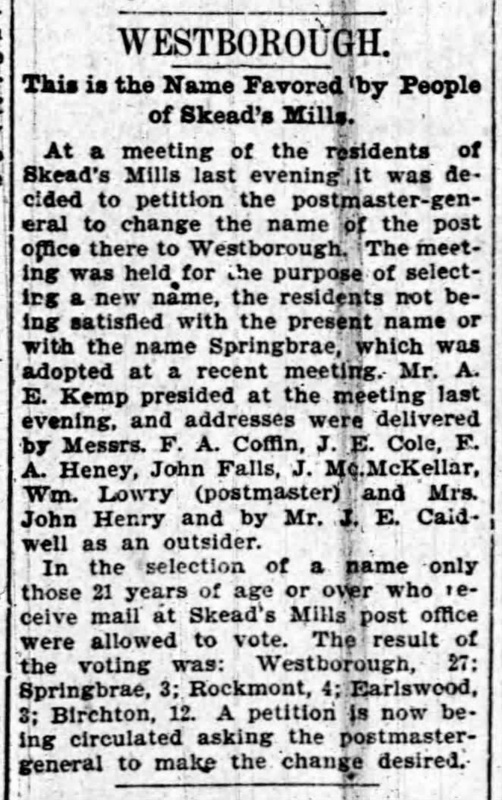 27 electors voted "Westboro" as the new name (the paper spelt it "Westborough" but that spelling was never used in any way, and was likely an error on the part of the Journal reporter), well ahead of the 12 votes that Birchton received, and the 4 that Rockmont garnered. Springbrae was reduced down to just 3 votes. So there you have it - Westboro was named in 1899 thanks to the votes of just 27 residents. 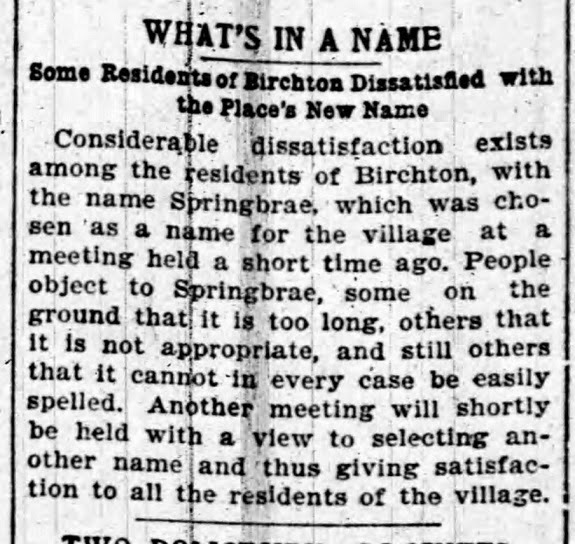 And if it wasn't for the hard politicking work done by probably a handful of villagers in early February of 1899, we'd probably nowadays be getting off the OC Transpo bus at Springbrae station, taking our pets to Springbrae Animal Hospital, and spending hot summer days swimming at Springbrae Beach.